Keith and Dana had a snowy January 2017 wedding! It was our first wedding of the 2017 season. It was amazing! We pretty much got a blizzard for photos! All I can say is, fairy tale wedding! They had their ceremony in Orchard Park, and their reception was at Salvatore's Italian Gardens in Depew, NY. Dana got ready at the Delavan Hotel in Depew, NY. It is the new hotel that is part of Salvatore's. It is a gorgeous hotel! We loved the room the bride got ready in. We love to get the bridesmaids involved as much as possible. 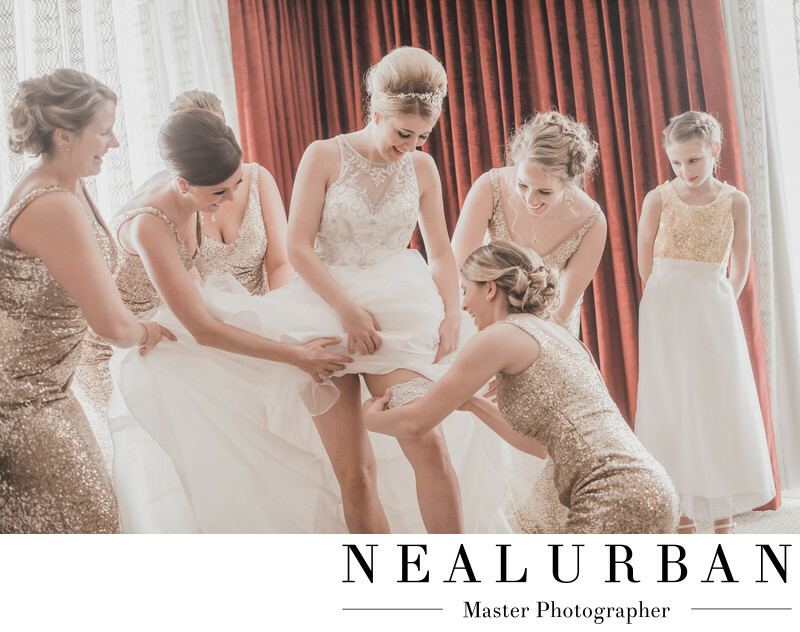 Some of the funnest getting ready portraits are when it's time to put the garter on. We absolutely loved this image. All of the bridesmaids are part of the image. Their expressions are great! The bride kept telling her maid of honor to put the garter higher and higher so it wouldn't slide down her leg. The way she said it made all of the girls start laughing. The only thing we did for this image was place the bride and her maid of honor in good lighting. Then the rest of the bridesmaids filtered in around them. It was such a great moment. We even found ourselves laughing behind the camera. The little flower girl is really cute in this image too. She wasn't too sure what was going on, but has the cutest little smile looking in on the rest of the bridesmaids. She just wanted to be a part of everything. We made sure to involve her as much as possible. All of the ladies look so good in this image. Those red curtains look so good with their sequin gold dresses. They all look so glamorous! We love when we have a fun group of people in the wedding party and who want to be a part of everything. That doesn't always happen. People dread photos sometimes. We do our best to make them enjoy every moment. They are there for the bride and groom and a super important part of the day! Location: 6461 Transit Rd Lancaster NY 14043 United States.